Tony Bean Tony Bean, one of America’s most renowned smallmouth bass fishermen, is back fishing and teaching anglers the sport he loves. 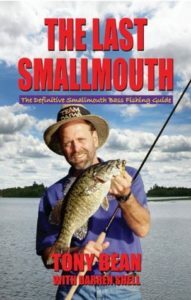 The Last Smallmouth provides step-by-step techniques for catching the elusive smallmouth as well as showing anglers good fishing practices. Entertaining stories illustrate Tony’s teachings and give further insight into the art of smallmouth bass fishing. New fishermen and seasoned anglers alike will come to love his words of wisdom. Packed with illustrations and fun photos, this book is the ultimate smallmouth bass fishing resource.